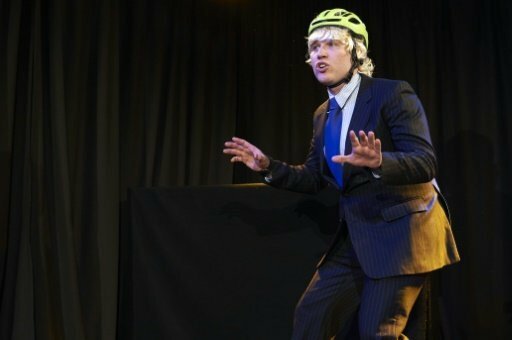 LONDON (AFP) -- Wearing a blonde wig and bicycle helmet, a disheveled Boris Johnson sings and raps at a demonic Vladimir Putin -- Brexit as tragicomedy has hit the London stage. Five months after Britain’s shock referendum to leave the EU, “Brexit: The Musical” opened this week with a star role for Johnson, the gaffe-prone Brexiteer turned foreign secretary. “The trick (to play Boris Johnson) is mainly to pretend to know what you are doing but really sound like you don’t have a clue of what’s going on at any time,” actor James Sanderson told AFP. Nearby, UK Independence Party leader Nigel Farage (played by Jack Bradley) holds a beer in one hand and sings about the glories of the people and Britannia, while Prime Minister Theresa May (RJ Seeley), portrayed as a Big Brother figure, keeps a strong hand on the Brexit tiller. Opposition Labour leader Jeremy Corbyn (Stephen Emery) is brilliantly boring, while Michael Gove (Chris Vincent), Johnson’s fellow Brexiteer who betrayed him in a failed bid for the premiership, is castigated by his Daily Mail journalist wife. “I try to be fair on both sides,” said writer David Shirreff, a former journalist for The Economist. Shirreff has previously delved into satire with a trilogy of musical comedies, including one, “EuroCash,” that looks at the world of finance. The play, which is showing above a pub at the Canal Cafe Theatre in the Little Venice district, involves a huge array of characters, including Donald Tusk, Jean-Claude Juncker and Angela Merkel -- all played by the cast of five. “There are comedies about World War I, the second World War, maybe it’s that kind of situation. We are in a war situation and we have to laugh about it,” Shirreff said. The problem with writing about current affairs is that the situation keeps evolving, and Shirreff had to write in a judge after the High Court ruled that Parliament must have a vote before Brexit starts. Farage’s meeting with US President-elect Donald Trump over the weekend will also probably make it into later performances. “I don’t know whether it matches with Brexit but it certainly is an extraordinary development in global politics,” Shirreff said. The play has been going down well with its audience. In the scene where Farage announces his resignation as UKIP leader -- the politician later returned as interim leader -- one woman shouted her approval. “I think we need a good laugh about Brexit because it is such a farce, unbelievable and bizarre and sad. I think it can be quite cathartic,” said one spectator in her 50s, Suzanna Tarbush. “Brexit: The Musical,” directed by Lucy Appleby and composed by Frederick Appleby, is sold out until Friday, but will return in January and February.